The Mind Tools Club forums are safe spaces where we have candid conversations. A few years ago, one of our members – let’s call him John – shared his time management woes with us. John had trouble keeping up with all of his tasks. This situation sapped his energy, and his will to complete his work. So, he decided to get things under control by making a to-do list of all the pending items – some of them had been due for a long time already. He ended up with such a daunting list that he felt completely overwhelmed. But that wasn’t all. John added that he had found lots of useful reading material about time management, but that working through it seemed like an impossible task in itself. He often planned to use the weekend to catch up. On Friday evening he felt hopeful and optimistic, but by Sunday evening he just felt that he had wasted yet more time. Both John and April’s stories contain elements of self-sabotage. They procrastinated, set unrealistic goals, didn’t plan properly, couldn’t stick to the plans they did make, and felt shame and guilt about always lagging behind. In our Twitter poll this week, we asked which area of your life suffers the most when you procrastinate or self-sabotage. Almost half of the participants said that their self-care or “me time” was the worst affected. Another quarter of the participants said that their careers suffered. Click here to view all the options and the results. In what ways do you sabotage yourself? What are some of the signs and symptoms of procrastination? What are some of the tasks or decisions you typically put off? Why do you put off these tasks and decisions? What makes them hard to do? In what ways might your self-sabotaging influence others? What emotions do you experience when you procrastinate or insist on doing everything yourself? Follow us on Twitter to make sure you don’t miss out on any of the action this Friday! We’ll be tweeting out 10 questions during our hour-long chat. To participate in the chat, type #MTtalk in the Twitter search function. Then, click on “All Tweets” and you’ll be able to follow the live chat feed. 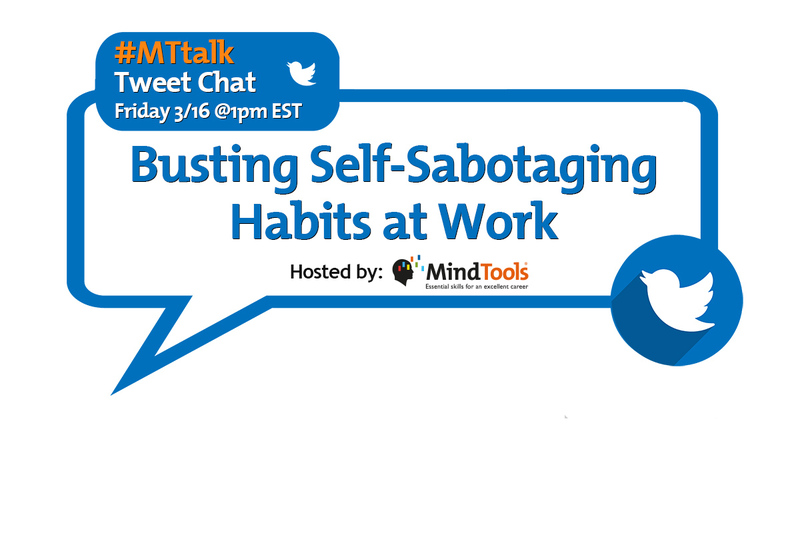 You can join the chat by using the hashtag #MTtalk in your responses. Want to become an expert at managing your workload? Join the Mind Tools Club before midnight PST, Thursday, March 22, 2018, and get our interactive PDF, “Take Control of Your Time” (worth $19.99), absolutely FREE. This toolkit teaches you the core skills you need to manage your time effectively, to delegate and schedule work, and to banish bad habits, once and for all! So, join the Club today for just $1 and start taking control of your time, and your career!